Improving any room in your home when you only have a small budget to play with can be challenging. However, it is far from impossible. This is especially true when it comes to the bathroom, and many people feel that they can’t achieve perfection without spending big. Today, we’re going to take a look at a few budget-friendly ideas that can change your bathroom from undesirable to a room you can take genuine pride in. First of all, it’s important to have a budget in mind for your bathroom. Once you have that, you know exactly what you have to work with, and can concentrate on finding the best deals. Think carefully about what needs replacing, and what could do with a simple polish. Tiles, for example, can be expensive, but do you need to change them? You can often get a good as new look just from cleaning out the grout. Yes, hiring a bathroom designer will eat into your budget. But they will also know exactly where to look to find what you need, and their fee will come straight out of your budget. Many people think that this kind of service is only for the wealthy, but that’s far from the case. If you want to make the most out of your money, it’s worth thinking about. Take a look at your favourite home and design websites to seek out some inspiration. You can then move on to the retailer website to pick out similar, but cheaper options. You should also make some trips out to your local bathroom store, and don’t be afraid to ask questions of the sales team. You aren’t under any obligations to buy anything, and they may have some unadvertised special offers under their belts. Another way to cut costs is to keep to the absolute basics. For example, if you have a small bathroom, instead of investing in a bath, why not think about installing a stand alone shower? Take a look at some options over at Bella Bathrooms to see the kind of look you can achieve, and the way that a stand-alone unit can maximise your space. Also, think about the tiling. 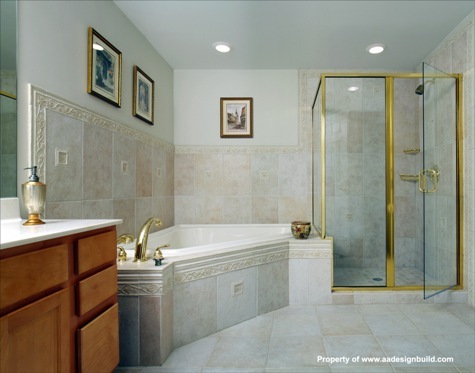 You don’t have to tile the entire room and can save money by sticking to the essential wet areas. One of the costs of creating a new bathroom that many people forget are the accessories. Wall units, towel racks, and vanities can all cost a lot of money that, in a lot of cases, could take you over budget. So, have a good think about sourcing these from somewhere cheaper. Charity shops and second-hand furniture traders are all good places to find alternatives. Not only will they be far cheaper than buying new, but it will also give you the chance to create an entirely unique bathroom. Well, we hope that has helped you see where you can make some savings on your bathroom. Any tips to share? Let us know in the comments section below.